It is estimated that since September 2000 the Israelis have uprooted almost 400,000 Palestinian olive trees. Since the building of the wall this number has grown drastically as orchard after orchard is cleared, or farmers are left cut off from their land. Olive trees and their harvest are vital to the economy and are a symbol of the Palestinian heritage and identity. Many farmers have been left destitute by the loss of their only source of income and this has had a knock-on effect on labourers and other parts of the economy. 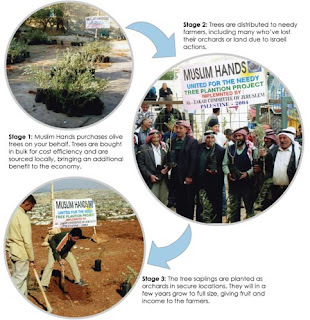 Recognising this need, the willingness of people around the world to help the Palestinians and the real difference that could be made, Muslim Hands launched our olive tree plantation scheme in 2003. The idea is simple: for only £10 you can pay for an olive tree to be planted inPalestine in your or a loved one's name. We will send you a Certificate of Plantation (see above), making this an ideal gift. Moreover, together we can make a real difference to the lives of thousands of Palestinians. Since the scheme was launched we have planted well over 35,000 trees and restored the livelihoods of hundreds of people. Olive trees are of course also an excellent form of sadaqa jaria (continuous charity) and will be a source of reward for as long as individuals or the community benefit.